From routine maintenance to general repairs, transmission work to towing and beyond, Second Street Repair is here to be your full service auto body shop and towing provider in Atlantic, IA. Since 1992 we’ve offered top-notch workmanship, tenured expertise and friendly services that you can trust when it comes to your vehicle. Your vehicle is made up of numerous systems that all work together to get you from Point A to Point B. When something goes wrong, however, it can affect the entire auto, which means you’re left seeking a professional to set things right, to get you back on the road safely. Second Street Repair is here to be your full and complete service provider, tending to any and all automotive needs you might have. Our experienced staff and comprehensive shop are equipped to tackle just about any facet of auto repair you bring us, from routine maintenance to general repairs, comprehensive transmission work to exhaust and muffler troubles. And, no matter the job, we always deliver the best in quality workmanship and results. We offer 24/7 emergency towing in Atlantic, IA, for your convenience. We’re a family operated, locally owned business. We specialize in custom and true duel exhaust. 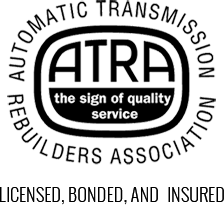 We’re members of the Automatic Transmission Rebuilders Association (ATRA). We’re totally licensed, bonded and insured for your peace of mind. Contact us today for a free initial diagnosis or a free road test analysis, to ensure your vehicle is getting top notch care from experienced professionals!